This book is free on these days only – 04/14/2018 at midnight PST until 11:59 pm on 04/14/2018. If the dates are the same that means the book is free one day only. 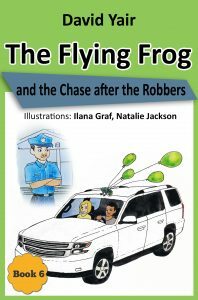 This is the sixth book in “The Flying Frog” series. You surely know the children of the Rimon family, who love adventure and always volunteer to help the police in solving mysteries. As soon as the two boys heard about a bank robbery, they immediately offered their help to Azzuz, the chief of police, and recruited Quack the frog to their aid. How can a frog help? What happened to the bank robbers? Let’s go together for an adventure!